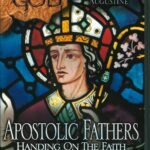 As promised at Steubenville for the attendees of my talk on “Suffering and Martyrdom in the Early Church,” you can find the timeline of the Apostolic Fathers here. You can also download my free timelines for the 1st Century and St. Paul. The two books I mentioned and read from are Early Christian Writings and Eusebius’ History of the Church.